Boasting NVIDIA's Turing GPU architecture, the new RTX series gives a massive increase in performance compared to previous generations. GeForce RTX graphics cards are powered by the Turing GPU architecture and the all-new RTX platform. This gives you up to 6x the performance of previous-generation graphics cards and brings the power of real-time ray tracing and AI to games. The revolutionary NVIDIA Turing architecture, combined with ASUS all new GeForce RTX platform, fuses together real-time ray tracing, artificial intelligence, and programmable shading to give you a whole new way to experience games. Delivering the latest NVIDIA Turing gaming experience in its purest form, the ASUS Dual GeForce RTX 2080 melds performance and simplicity like no other. Leveraging advanced cooling technologies derived from flagship STRIX graphics cards, the Dual GeForce RTX 2080 opts for substance over style, the perfect choice for a well-balanced build. Buckle up and engage cutting-edge gaming prowess. ASUS patented Wing-blade fan design is cool and quiet with 105% greater static pressure over the heatsink compared to traditional axial fans. IP5X dust resistance seals the fan's internals from particle ingress to keeps things running smoothly. This generation of top-end cards adopt a 2.7-slot footprint to accommodate a larger heatsink because bigger is better. ASUS have increased the overall surface area of their cooling array by over 50% compared to previous gen. 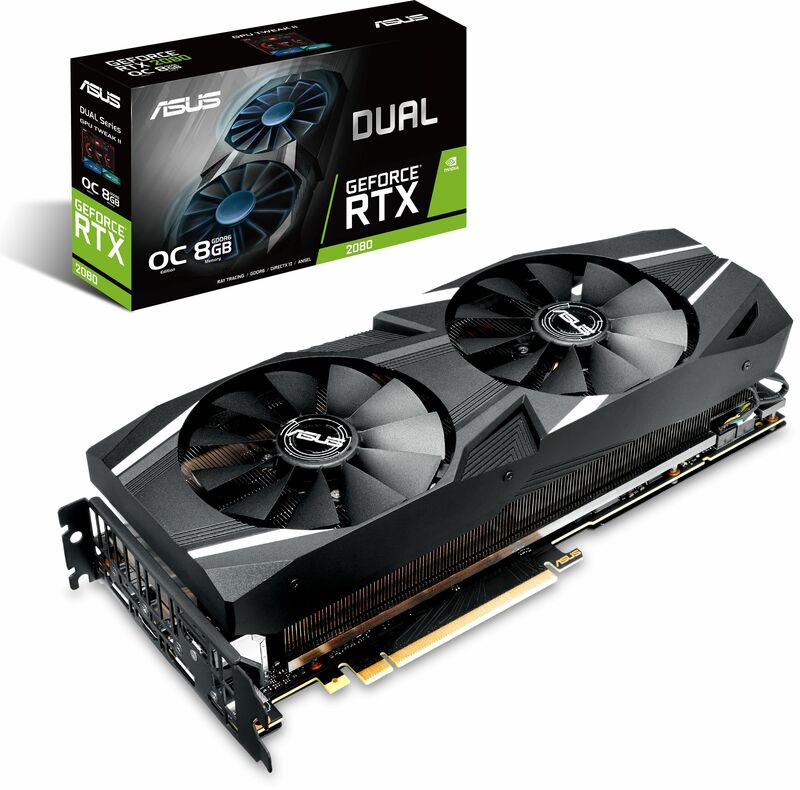 If you want to squeeze the most out of the Dual GeForce RTX 2080's performance, the latest design gives you a lot more thermal headroom for overclocking. If you're just looking for an amazing plug-and-play experience, the extra heat dissipation keeps your fans running at lower speeds while you game. 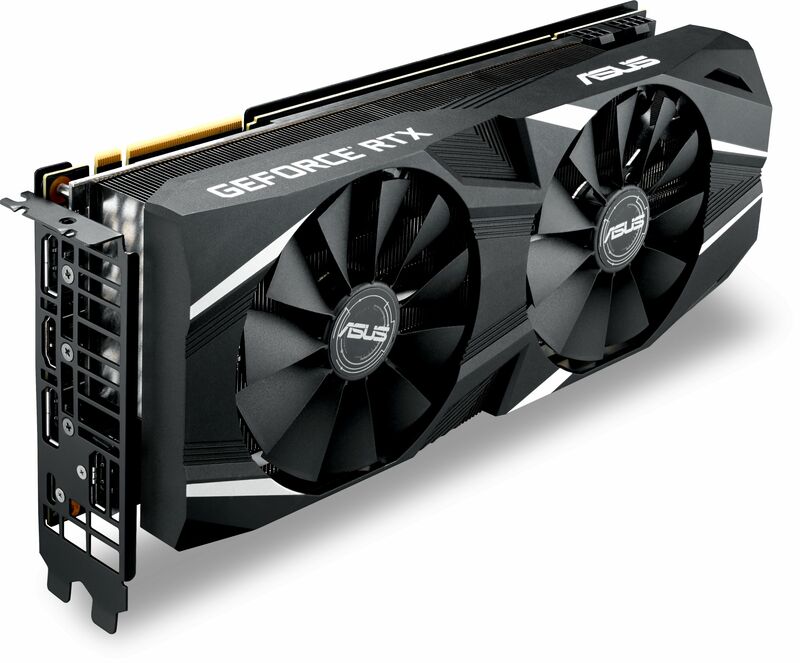 The Dual GeForce RTX 2080's densely packed PCB is reinforced by an aluminium backplate that adds structural rigidity, helping to prevent PCB flex and protect components and trace pathways from damage. ASUS extensive performance and stress tests begin with the very latest chart-topping titles — like Fortnite, League of Legends, Overwatch and PlayerUnknown's Battlegrounds. They also carry out reliability trials that include a 144-hour stability test and a series of 3DMark benchmarking runs to ensure the card performs well when pushed to the limits. By combining advanced VR rendering, real-time ray tracing, and AI, the Dual GeForce RTX 2080 will take VR to a new level of realism. Cable management is much improved with VirtualLink, which utilises an Alternate Mode of USB Type-C to provide a quick, single-cable connection for next-generation VR headsets. The Dual GeForce RTX 2080 features NVIDIA G-SYNC display technology for the smoothest and fastest gaming imaginable, eliminating screen tearing and minimising display stutter and input lag. Enjoy the latest first-person shooters, sports and action-adventure games at super-fast frame rates, even at the highest graphics settings!